Being self-employed has many advantages, including getting paid in full without employer deductions. As an independent contractor, freelancer or self-employed individual, getting a check for the gross amount owed to you can be pretty exciting. Nevertheless, Uncle Sam still wants his cut. This is where the 1099-MISC tax form comes in. Whether you just received your first 1099 MISC or need to send someone a 1099 MISC, here is a simple breakdown of how it all works. 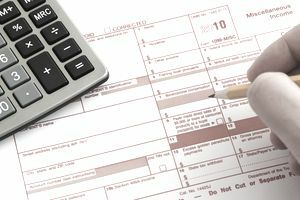 What Is a 1099-MISC Tax Form? There are several 1099 forms, such as the 1099-INT, for interest payments and 1099-R for retirement distributions. The 1099-MISC Form is similar to the W-2, in that it reports income to a worker and the IRS. The difference is that the 1099-MISC is used by organizations that pay contractors or freelancers $600 or more during a calendar year. Whereas employers deduct taxes from your income and report it along with your income on a W-2, clients who hire you as a contractor don't make any deductions, but still report what they paid to you on the 1099-MISC. For example, if you are an author, Amazon (and other book retailers if you're self-published), your publisher and/or your agent, will send you a 1099-MISC for your royalty payments. Legally, all individuals or companies who pay independent contractor or freelancer $600 or more during the year are required to send a 1099 Form by January 31st of the tax-filing year. If you did freelance or contract work for which you were paid $600 or more by a business in a year, you should expect to have at 1099-MISC by the end of January the following year. For example, if you earned $600 from Business A in 2018, you should receive a 1099-MISC from it by January 2019. 1. If your total payment was less than $600 total, the payee doesn’t have to send a 1099 Form. If you earned less than $600 from a single company, it is not required to send you a 1099-MISC, but you are still required to report the income you earned. For example, if you earned $500 from 100 different companies, none of these companies are required to send you a 1099-MISC, you're still required to report the $50,000 you earned. 2. If your payment was $600 or more, your payee may have just forgotten or doesn't know, in which case, you should contact the company. If you hadn't already filled out the W-9 Form (similar to the W-4 for employees), which provides your social security number or tax-ID number (EIN) you should send one when you make the request for the 1099-MISC. If you work for several clients/businesses, earning over $600 from each, you'll receive a 1099-MISC from each. If you worked for several clients, but didn't earn $600 from each, you may not receive a 1099-MISC, but you're still responsible for including income you earned from them on your taxes on Schedule C.
If you've outsourced work in your home business to other freelancers or contractors, you need to ask them to fill out a W-9. If you paid them more than $600 during the year, you need to prepare and send them a 1099-MISC at the end of January following the year they did the work. You also need to send a copy to the IRS. The IRS has specific instructions about sending the 1099-MISC in, including what paper to use. For example, if you've contracted with a virtual assistant, a web designer, and social media manager, and paid them all over $600 over the course of a calendar year, you'd need to send them each a 1099-MISC by January 31 of the following year. If you paid the web designer less than $600 during the year, you wouldn't need to send a 1099 to that person. The IRS has specific rules about how to file the 1099-MISC. You'll need to order from the IRS or pick up from your local office store special red-colored 1099-MISC forms to input your information. There is business financial software that will help you complete the form and then you can print it out on the special paper. Note that attorney fees of $600 or more may be handled differently than the traditional 1099. Check out the IRS website to get clarification. While it seems like a lot of work and hassle, money you pay to contractors can be a tax deduction. If you've received 1099-MISC with inaccurate information, contact the sender to request a new one with the right info. If you have to send a 1099-MISC, it doesn't hurt to verify the information and income with the person to insure you do the form right the first time. If you sent a 1099-MISC with incorrect information, void and resubmit an updated one to the contractor and the IRS. Get up to date information, instructions and form about the 1099-MISC at the IRS website.